Liverpool went back to the top of the Premier League with a convincing win over Bournemouth and there were plenty of talking points to debate. 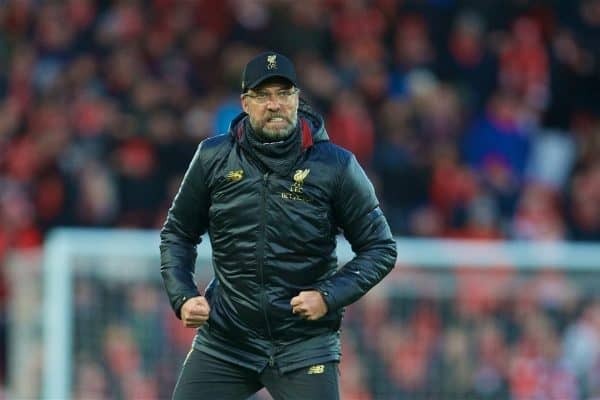 Liverpool’s best performance of the calendar year sent the Reds soaring three points clear once more and several questions were emphatically answered. 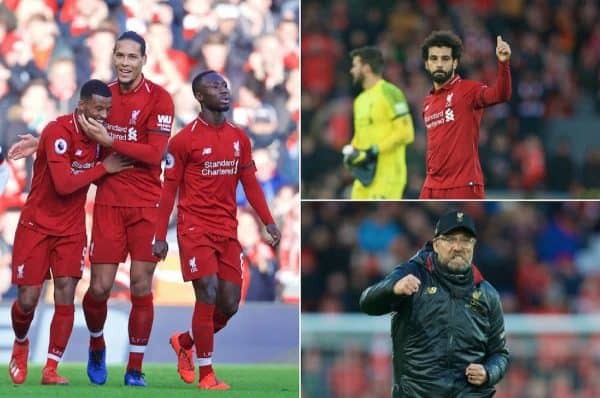 The three goals, three points and the clean sheet brought back the feel-good factor around Anfield, after a below-par week or two which briefly saw the Reds displaced at the top, albeit with a game in hand. With the win in the bag it’s still Liverpool’s title to win or lose, with a dozen league games now remaining. 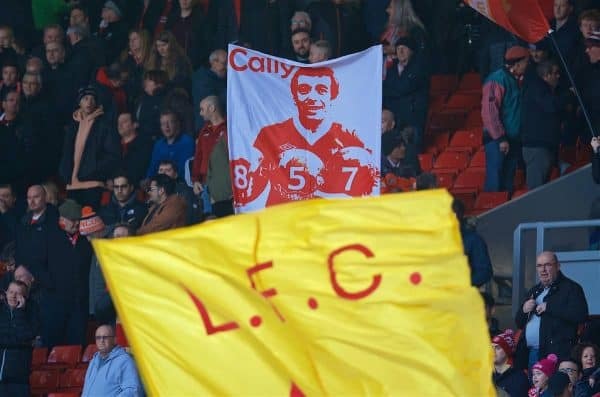 Karl Matchett (@karlmatchett) spoke to Matt Ladson (@mattladson) and James Nalton (@JDNalton) to get their views on the best and the worst of the match and how the Reds should line up going forward into a key run of games. The crowd: This was support from pre-match and throughout. There were no moans or groans, the Kop was far, far better than for a usual 3pm game vs. mid-table opposition. I’d like to see the Kop take what Klopp has said and be full earlier, but this was a step in the right direction and a huge positive. 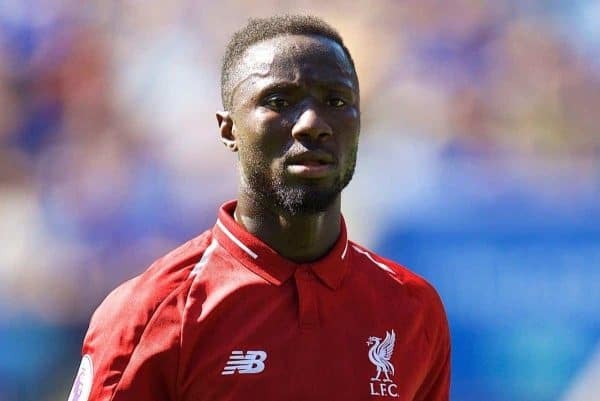 Keita: Enjoying a run of games and seemingly finding his confidence. Not many players see *that* pass for Firmino for Salah’s goal, let alone play it rather than the safe, obvious one to Robertson on the left. He’s going to be superb. 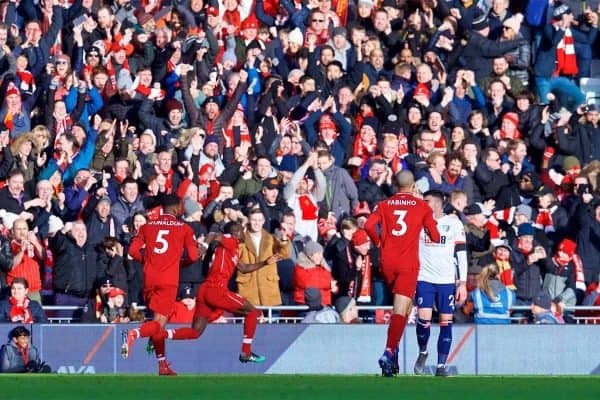 Gini: Had the shits but gave Bournemouth the run around. Played far more advanced, making runs into the half space a la Oxlade-Chamberlain later last season. That goal was consummate composure. The front 3: Bobby was awful at West Ham but here he was back to the No.9 of last season, dropping in and making a midfield diamond with Mane and Salah advancing inside. Nice to see again. JAMES: Naby Keita had the game we’ve been waiting for. Continuing where he left off in the second half against West Ham, he didn’t get on the scoresheet, and didn’t even register an assist, but he played a part in all three goals. The players didn’t look nervous or tense even though they needed a win to put pressure on Man City, and at times it was exhibition stuff. But at the same time the tricks and flicks are as effective as they are entertaining. Firmino’s back-heel to set up Salah in front of the Kop and the way Wijnaldum lobbed Boruc aren’t signs of a team under pressure. The third goal summed all of this up — Keita’s excellence, and the carefree, free-flowing football. 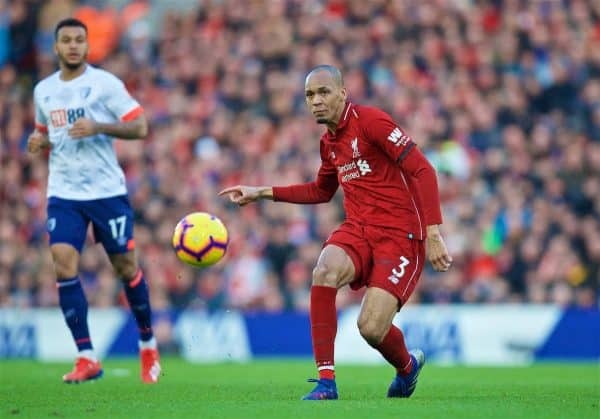 Also, there was talk that Fabinho can’t play in a midfield three, and it seems he put that one to bed yesterday as no one has mentioned it after he put in another good performance. KARL: Matt and James have covered the biggest points there, with Gini superb and the attack exchanging passes and positions brilliantly. Importantly, this was the best midfield performance of the season, though. The pressing, covering and winning back possession was exemplary, the positional work was good and the use of the ball was forward-thinking. Loved Wijnaldum’s constant runs into the attacking midfield zone; Liverpool have been crying out for runners from deep at times this season and he’s brilliant at it. MATT: Not a lot…I’m struggling to think of any. Even the away fans didn’t sing about feeding Scousers or Liverpool’s captain slipping over—mind you, not sure they sang *at all*. Kinda bad that Eddie Howe—and Gary Lineker and his Match of the Day gang—don’t know the offside rule. Mane was not offside, you can’t play the ball with your arm and that was the only part of his body ‘off’; VAR would have rightly allowed the goal. JAMES: If there were any negatives, then you would have liked a few more goals when they running free towards the end of the game. Mane, Salah, Firmino and Trent all missed opportunities to bolster the goal difference column. The substitutes other than Trent didn’t really add anything, but they were given little time to do so. Maybe these two things are connected? You would like the players coming off the bench to add something to the game, or at least keep the team at the same standard, and at the moment that doesn’t look like the case, unless Shaqiri is on there. KARL: I’d have to add to James’ points: a fair few good chances missed and the substitutions. Klopp has suggested Rafa Camacho hasn’t the experience to deal with players as a right-back; here was a big opportunity to give him at least a half-hour. Sure, Trent needed to get a bit of game time too, but there would have been scope to play one ahead of the other given we were three goals up just after half-time. 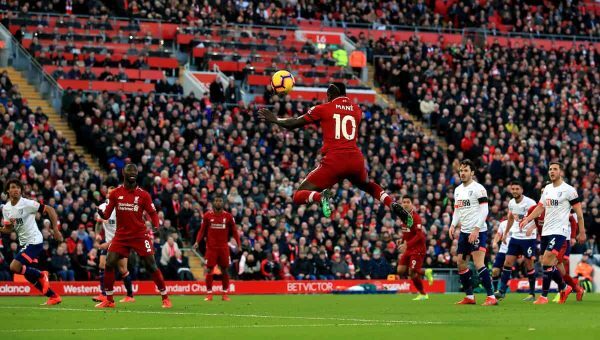 Mane’s header, Keita’s half-chance, Firmino’s one-on-one, Salah’s effort against the woodwork, Trent’s run through…we really could have hit six and it wouldn’t have flattered us. Nothing major though—it was a very good performance. I’d simply acknowledge that it came against a side who are terrible away, were without key players and play a style which suits us incredibly well. …and should Klopp be sticking now with 4-3-3 over 4-2-3-1? MATT: Tough question. It became apparent that 4-2-3-1 suited is much better a couple of months ago, so I think it depends on the opposition. The good thing is that Fabinho is key to each and he now looks comfortable in a 4-3-3. I’d expect we’ll go with the 4-2-3-1 against United and possibly Bayern, but for home games especially where we need to be dominant, I’d prefer to see the 4-3-3 – and with this attacking six as the default. JAMES: It worked well, allowing for a balanced midfield and an attack which was more familiar to last season’s. The movement of Firmino becomes more important in the 4-3-3, but the 4-2-3-1 can also be effective on its day, especially once Trent is back down the right. It’s good to have the option of using more than one formation depending on the personnel available and the opposition. KARL: Again I’d have to say: there’s now no reason to not see Fabinho in every single starting lineup from now until the end of the season unless he’s injured. He’s so good at stopping the opposition getting moving into our half, then gives great protection if they do—especially in that cut-back space just in front of the centre-backs. As for the shape, it’s always important to be flexible. I prefer the 4-2-3-1 for the majority of our central pairings, as I don’t think all of them get forward enough as a pair of 8s in the 4-3-3. If, however, we always have one of them effectively getting alongside the striker as Gini did here, that becomes a non-issue—and we’ve got another player coming back to fitness at some point who does the same job, of course, in Oxlade-Chamberlain. Against Bayern, at home and without Van Dijk, I think it’ll be 4-3-3 again.